Take a stand count by taking a diagonal path through the field and stop every 75 feet (or another predetermined amount of steps). Evaluate the stand by counting the number of plants in 1/1000 of an acre (17' 5" in 30 inch rows) in several areas of the field, then find the average plant population per acre. 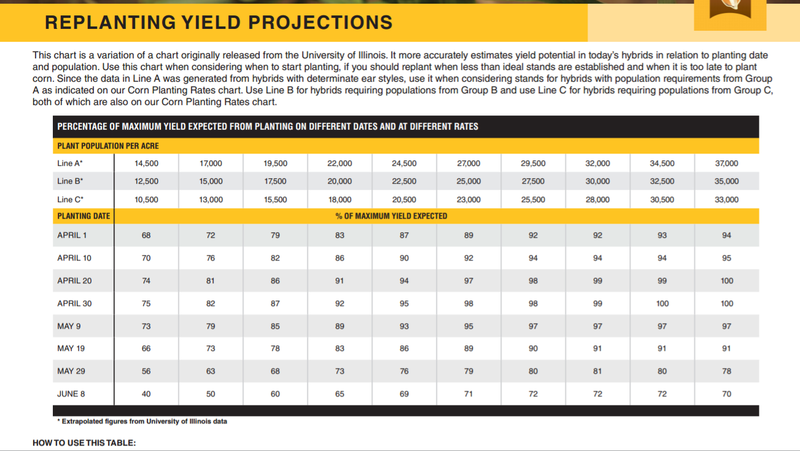 Burrus provides an easy to use Replanting Yield Projection Chart on their website. 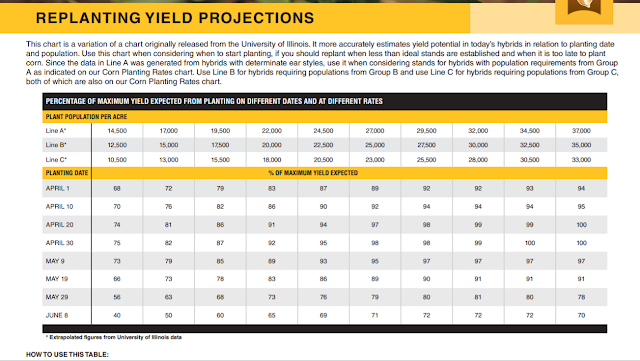 This chart allows you to make replant decisions by giving you an expected percent of maximum yield based on various planting dates and plant populations per acre. Line A, B, and C rows at the top of the page represent Burrus hybrids that have been placed in A (high), B (moderate), or C (low) planting rate categories. If you are not sure about the planting rate of the hybrid that you planting, you can go to the Corn Planting Rates chart. For example, if you planted a "B hybrid" on April 20th, and had an average plant population of 25,000, you can still expect to have 97% maximum yield potential, so there is no need to replant, because if you replanted the same hybrid on May 9th, and had an average plant population of 35,000, you would expect to have a 97% maximum yield potential. If you have frequent gaps within the corn row, you may want to subtract another 5% from the maximum yield potential. Another option, is the U of I Mobile Corn Replant Decision Aid. Burrus has furnished 100% free replant seed since 1935. To make sure you don't inadvertently create a trait change, always replant products from the same "family" of traits. Have questions? Contact your Burrus agronomist.